VATICAN CITY (CNS) — In an effort to shake its image as a secretive, scandal-ridden institute and improve its relationship with the media, the Vatican bank has launched its own website. “It is an important part of transparency to launch a website,” said Ernst von Freyberg, president of the Vatican bank. 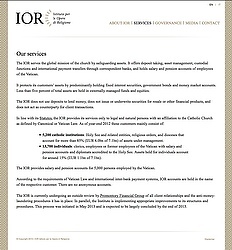 The site for the bank — formally known as the Institute for the Works of Religion — went live July 31 at ior.va. Having an online presence is meant “to tell our customers, the church, the interested public what we are doing, how our reform efforts are progressing and what the scope of our work is,” he told Vatican Radio. But it’s also a way for the bank to try to facilitate relations with the press, which has given extensive coverage of the bank’s woes and less to its campaign to clean up. The website, published in English and Italian, lists a number of contacts — including two people dedicated to press inquiries — complete with direct phone lines, street addresses and emails. Von Freyberg told Vatican Radio, “We consider journalists and the media our key intermediaries with the public, but also with those in the church who are interested in our work. ABOARD THE PAPAL FLIGHT FROM BRAZIL (CNS) — Pope Francis said he was responding to the clear wishes of the College of Cardinals when he set up commissions to study the Vatican bank, Vatican financial and administrative procedures and the reform of the Roman Curia. The pope also said he knows people have spoken about some kind of “gay lobby” at the Vatican protecting certain priests by threatening to blackmail others. 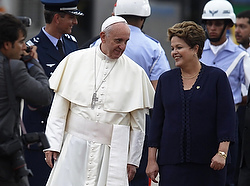 The pope said the “lobbying” is what is worrisome. 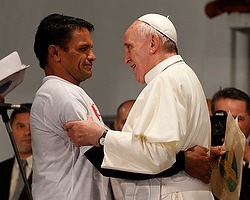 RIO DE JANEIRO (CNS) — Pope Francis addressed a group of recovering drug addicts in a working-class neighborhood of Rio, offering them a message of compassion and hope as well as a call to self-determination. At the Hospital of St. Francis of Assisi, which he called a “shrine of human suffering,” he told patients they were the “flesh of Christ,” like the leper embraced by the institution’s patron saint in a crucial step toward his conversion. He also said those struggling with drug dependency deserve the “closeness, affection and love” of all society. Yet the pope also stressed the necessity of personal will in recovering from addiction. VATICAN CITY (CNS) — Pope Francis sent condolences to the archbishop of Santiago de Compostela, Spain, after a train crash left at least 80 dead and more than 100 injured. The telegram was sent July 25, the feast of St. James the Apostle, patron saint of Spain. The accident occurred the previous day when the train, traveling above the speed limit, derailed. Pope Francis’ telegram to Archbishop Julian Barrio of Santiago de Compostela said he was praying for the victims, and he expressed his spiritual closeness to those suffering. In Washington, the White House said at least six Americans were among those killed, injured or missing.